This will be a most interesting talk to lovers of jewelry, history and design. Andrew Prince has had a passion for jewelry since he was a small child. 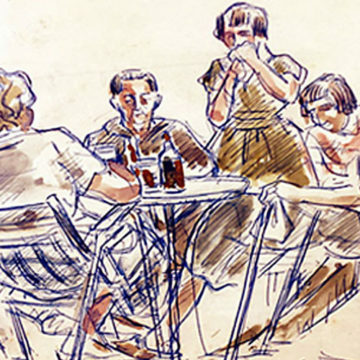 In fact his enthusiasm can be traced back to the time when, at the age of three, he swallowed one of his mother’s pearl earrings having found her jewel box hidden from him in a cupboard. 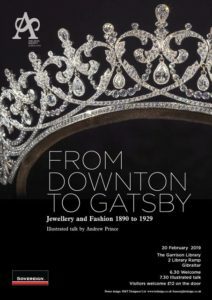 Among his many commissions including Micheal Jackson and Shirley Bassey he was asked to create the jewels for the main characters in Downtown Abbey, this inspired him to create a talk based on Downtown Abbey and the change of styles of the time portrayed. Jewelry and Fashion are often seen as two entirely separate and distinct fields of design, but this is very far from the case. 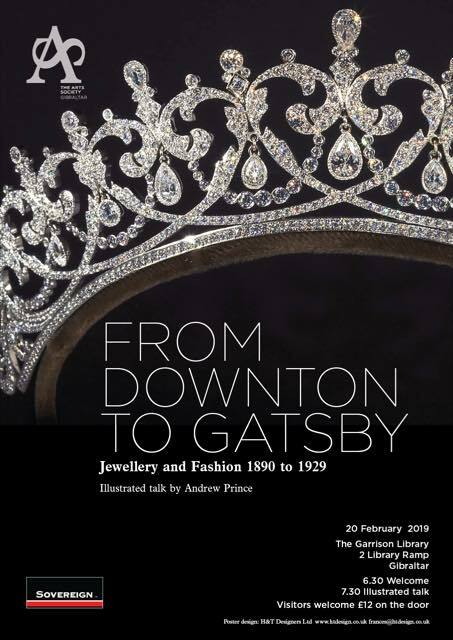 In his talk Andrew guides you through the extraordinary periods and events between 1890 and 1929, where the great fashion houses collaborated with the finest of jewelry to produce works of art of outstanding quality and glittering opulence. “You can’t have fun with diamonds, the value of them makes it all too serious. Jewelry should be about beauty not cost. If it has to be locked up it is not a jewel , it’s a worry” Andrew Prince. Come and join us 20th February at the Garrison Library, 6.30pm meet and greet with complimentary drinks,7.30 pm lecture time. Guests welcome £12.00 at the door. This month’s talk is sponsored by Sovereign, who offer advice and procedures regarding your financial wealth, family and personal future.